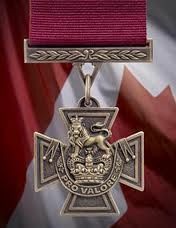 The Victoria Cross (V.C.) is the highest military decoration awarded for valour "in the face of the enemy" to members of the armed forces of Commonwealth countries and previous British Empire territories. It takes precedence over all other orders, decorations and medals. It may be awarded to a person of any rank and any service and civilians under military command. The Canadian Victoria Cross is a military award that "shall be awarded for the most conspicous bravery, a daring or pre-emient act of valour or self-sacrifice of extreme devotion to duty, in the presence of the enemy". For the purpose of this decoration, "enemy" is defined as a hostile force, including armed mutineers, armed rebel, armed rioters, or armed pirates. Canada does not have to be at war to acknowledge the existence of an enemy that fits this description. It can be awarded to members of the Canadian Forces of any rank in any service, and to allies serving under or with Canadian military command. It is the highest honour in the Canadian honours system. The Canadian medal is based on the original Victoria Cross instituted in 1856, although the Canadian version has several small changes in its appearance. To accomadate the official languages of Canada, the motto on the insignia has been changed from "For Valour" to the Latin "Pro Valore". Another small change is the addition of the Fleur-de-lis at either end of the scoll bearing the motto to accompany the traditional rose, thistle, and shamrock, thereby establishing a link with the floral elements found in the Royal Coat of Arms. The Canadian Victoria Cross is cast of a mixture of metal from 3 different sources: the specific gunmetal used in the production of the British Victoria Crosses (donated to Canada from the U.K.); metal from an 1867 medal minted in commemoration of the Confederation of Canada; and metals from all regions of Canada, from coast to coast to coast. No one has received the award since its creation in 1993. Note: Possibly the only Member of Parliament in the British Empire / Commonwealth to receive the Victoria Cross while elected to office. Colonel Peck was elected to Canada's House of Commons in 1917. James Cleland Richardson was born on 25 November 1895 in Bellshill, Scotland. His family emigrated to Canada around 1913 and settled in Chilliwack, British Columbia, where Richardson's father became the Chief of Police. Richardson was a driller by trade, and served for six months in the cadet corps of the 72nd Regiment (Seaforth Highlanders), a Vancouver unit with a prominent pipe band. When war broke out, Richardson volunteered for service and was part of the founding draft of Seaforths that made up the 16th Battalion. He arrived in France with the Battalion in February 1915, and throughout 1916, the Battalion was engaged in numerous battles during the Somme offensive. 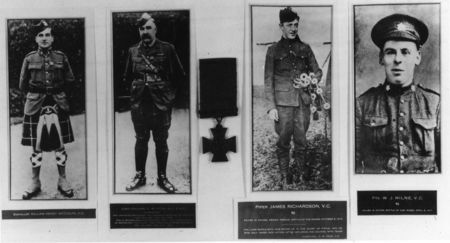 It was during the Battalion's attack on Regina Trench on 8 October 1916 that Richardson performed the incredible act that saw him awarded the Victoria Cross. He had received permission to accompany the attack on Regina Trench but was told not to play his bagpipes until ordered to do so. When the Battalion came up against an intact barbed wire entanglement, the attack stalled and Richardson began to play in full view of the enemy. Encouraged by his example, the Battalion forced its way through the wire and made it to the trench. Later, he was detailed to take back a wounded comrade and some prisoners, but after proceeding some distance he insisted on turning back to recover his pipes which he had left behind. Richardson was never seen alive again, and is presumed to have died on 9 October, seven weeks short of his twenty-first birthday. After hearing about Richardson being awarded the Victoria Cross, Major G.H. Davis of the 16th Battalion wrote to Richardson's father. Davis wrote, "He was a delightful chap, and in my company from when we left Vancouver. Never tired, however long the march was, and always ready with a willing hand to do anything and give the boys a tune, and always anxious to lead his company 'over the top'. He was a great loss to the Battalion, and I am sure greater to you. I had always hoped he would receive the V.C." "For most conspicuous bravery and devotion to duty when, prior to attack, he obtained permission from his Commanding Officer to play his company "over the top". As the Company approached the objective, it was held up by very strong wire and came under intense fire, which caused heavy casualties and demoralised the formation for the moment. Realising the situation, Piper Richardson strode up and down outside the wire, playing his pipes with the greatest coolness. The effect was instantaneous. Inspired by his splendid example, the company rushed the wire with such fury and determination that the obstacle was overcome and the position captured. Later, after participating in bombing operations, he was detailed to take back a wounded comrade and prisoners. After proceeding about 200 yards, Piper Richardson remembered that he had left his pipes behind. Although strongly urged not to do so, he insisted on returning to recover his pipes. He has never been seen since, and death has been presumed accordingly owing to lapse of time." Richardson's death is estimated as 9 October 1916, and he was officially declared dead due to "lapse of time". His remains were recovered in 1920 and he was interred at Adanac Military Cemetery in Miraumont, France, Plot 3, Row F, Grave 36. For almost 90 years, it was believed that Richardson's bagpipes were forever lost in the mud of the Somme. 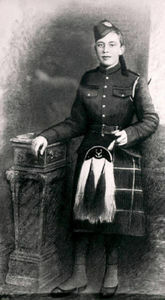 However, in 2002, Pipe Major Roger McGuire of The Canadian Scottish Regiment (Princess Mary's) responded to an Internet posting and discovered that a British Army Chaplain, Major Edward Yeld Bate, had found the pipes in 1917 and brought them back home after the war to an elementary school where he was a teacher. An anonymous donor facilitated the purchase of the pipes on behalf of the citizens of Canada, and on 8 November of 2006, troops from The Canadian Scottish Regiment (Princess Mary's) officially repatriated the pipes to Canada and placed them at the British Columbia Legislature where they are currently on public display. Canadian War Museum, Ottawa, Ontario. Motion Picture: Incredibly the Academy Award winning team at Paradigm Motion Picture Company has been working on a documentary style movie about the life of Piper Richardson. In the epic film series "The Pipes of War", " Unparalleled Valour, The story of Piper James Richardson, VC." Paradigm is able to provide the most accurate and unprecedented study of Canada’s only piper ever to earn the Victoria Cross and the conditions that he and the men of the 16th Battalion encountered during the Great War. For more info please visit: www.pipesofwar.com. William Henry Metcalf, an American citizen, was born on 29 January 1894 in Waite, Maine. While Canada and Britain began to mobilize for war in August 1914, it would be almost three years later before the United States would enter the First World War. With his country not yet at war, William Metcalf did what many young American men did; he crossed the border into Canada (without telling his mother) and enlisted in the Canadian army. Metcalf joined the 12th Battalion CEF at Valcartier, Quebec, in September 1914, and sailed for England with that battalion in October. Waiting for him in England was the American Ambassador to Britain. Metcalf's mother had asked for assistance in having her twenty year-old son returned to the United States. When asked if he was the Metcalf about whom all the letters had been written, Metcalf told the Ambassador that, "...I wasn't the man...I was from St. David Ridge, a little farming town outside of St. Stephen [New Brunswick]. The Colonel backed me up, so there was nothing he could do about it." After several months training in England, Metcalf was transferred to the 16th Battalion in France in May 1915. He went on to be wounded twice and to be awarded the Military Medal twice. However, it was said that it was his Victoria Cross of which he was most proud. 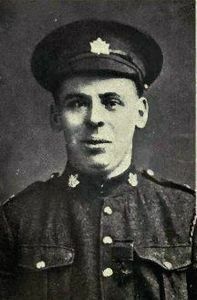 William Metcalf was one of seven Canadians awarded the Victoria Cross for actions on 2 September 1918 at Arras, France. When the battalion's right flank was held up, Metcalf rushed forward under intense machine-gun fire to a passing tank and directed it to fire along the enemy trench into an enemy machine-gun strongpoint. The strongpoint was overcome and heavy casualties were inflicted on the enemy. Although wounded, Metcalf continued to advance until ordered to take cover and have his wounds dressed. A witness to the action said, "...we found seventeen German machine guns in the same place, and all of them had been well used. How Metcalf escaped being shot to pieces has always been a wonder to me." "The battalion's right flank was held up, so Metcalf rushed forward under intense machine gun fire to a passing tank and with his signal flag walked in front of the tank directing it along a trench in a hail of bullets and bombs. The German machine gun strong-point was overcome and heavy casualties were inflicted on the enemy. The result was a critical situation saved. Metcalf continued to advance until ordered into a shell hole to have his wounds dressed." William Metcalf returned to his native Maine after the war and worked as an automobile mechanic. He is one of only six Americans to have been awarded the Victoria Cross. At his funeral in 1968, his casket was covered with the Union Flag of Britain, and among those in attendance were more than forty members of the Royal Canadian Legion. William Henry Metcalf is buried at the Bayside Cemetery in Eastport, Maine. The Canadian Scottish Regiment (Princess Mary's) Regimental Museum, Victoria, British Columbia. William Johnston Milne was born on 21 December 1892 in Scotland. Like many other British men during this time, he came to Canada in order to establish himself. He emigrated in 1910 and found work on a farm near Moose Jaw, Saskatchewan. Milne joined the 46th Battalion CEF in Moose Jaw in September 1915, and arrived in England with that battalion in October of the same year. He was posted to the 16th Battalion in June 1916. 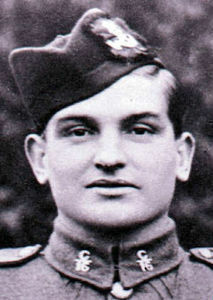 Milne was awarded the Victoria Cross for his actions on 9 April 1917 near Thelus, France, druing the battle of Vimy Ridge.When Milne saw a German machine-gun position firing on his fellow troops, he crawled on his hands and knees until he managed to reach the gun, kill the crew, and capture the gun. Milne later repeated this action against a second machine-gun crew, but was killed shortly afterward. He never knew of the success of the attack. "For most conspicuous bravery and devotion to duty in attack. On approaching the first objective, Pte. Milne observed an enemy machine gun firing on our advancing troops. Crawling on hands and knees, he succeeded in reaching the gun, killing the crew with bombs, and capturing the gun. On the line re-forming, he again located a machine gun in the support line, and stalking this second gun as he did the first, he succeeded in putting the crew out of action and capturing the gun. His wonderful bravery and resource on these two occasions undoubtedly saved the lives of many of his comrades. Pte. Milne was killed shortly after capturing the second gun." Milne is one of the 11,285 Canadian soldiers killed in France with on known grave who have their names inscribed on the Vimy Memorial. William Johnston Milne was 24 years old. Cyrus Wesley Peck was born in Hopewell Hill, New Brunswick in 1871. Before the First World War he was a Lieutenant-Colonel in command of a militia unit, the 68th Regiment (Earl Grey's Own Rifles) in Prince Rupert, British Columbia. Peck relinquished his position of Lieutenant-Colonel to become a Captain in the 30th Battalion CEF in November 1914. The 30th Battalion left Canada in February 1915. In April, Peck was promoted to Major and posted to the 16th Battalion in France. In addition to the Victoria Cross, Peck was awarded the Distinguished Service Order twice, mentioned in dispatches five times, and wounded twice. As Lieutenant-Colonel, Peck commanded the 16th Battalion from November 1916 until January 1919. He also became the first Commanding Officer of the newly formed Canadian Scottish Regiment in 1920 when the 88th Regiment (Victoria Fusiliers) and the 50th Regiment (Gordon Highlanders) amalgamated. 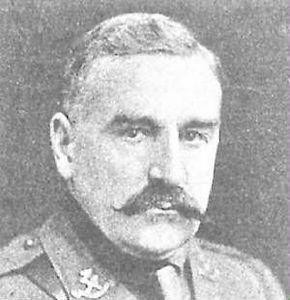 On 2 September 1918 at Cagnicourt, France (the Drocourt-Queant Line), when Lieutenant Colonel Peck was commanding the 16th Battalion, the unit was held up by enemy machine-gun fire after capturing the first objective. Peck went forward and made a personal reconnaissance under very heavy fire. After returning, he reorganized the Battalion and pushed them forward. He then went out, under the most intense artillery and machine-gun fire and intercepted the tanks, pointing out where they were to make for, and thus paving the way for an infantry battalion to push forward. "For most conspicuous bravery and skilful leading when in attack under intense fire. His command quickly captured the first objective, but progress to the further objective was held up by enemy machine-gun fire on his right flank. The situation being critical in the extreme, Colonel Peck pushed forward and made a personal reconnaissance under heavy machine-gun and sniping fire, across a stretch of ground which was heavily swept by fire. Having reconnoitred the position he returned, reorganised his battalion, and, acting upon the knowledge personally gained; pushed them forward and arranged to protect his flanks. He then went out under the most intense artillery and machine-gun fire, intercepted the Tanks, gave them the necessary directions, pointing out where they were to make for, and thus pave the way for a Canadian Infantry battalion to push forward. To this battalion he subsequently gave requisite support. His magnificent display of courage and fine qualities of leadership enabled the advance to be continued, although always under heavy artillery and machine-gun fire, and contributed largely to the success of the brigade attack." Peck left the 16th Battalion in 1919 and took his place as a Member of Parliament for the British Columbia riding of Skeena to which he had been elected in 1917. He is reputedly the only Member of Parliament in the British Empire to have been awarded the Victoria Cross while in office. He was a member of parliament until 1921. In 1924, he was elected as a member of British Columbia's Legislative Assembly. He was re-elected in 1928 but resigned to become a member of the Soldiers' Pension Board. In 1921, Peck was promoted to Colonel and placed on the Reserve of Officers. With war once again on the horizon in 1939, at age sixty-eight Peck volunteered his services to Canada. However, for various reasons he did not take the position of Pacific Coast Militia Rangers Area Commander. Until his death in 1956, Colonel Peck remained a strong supporter of The Canadian Scottish Regiment and attended many Regimental functions. Fraser Cemetery, New Westminster, British Columbia.